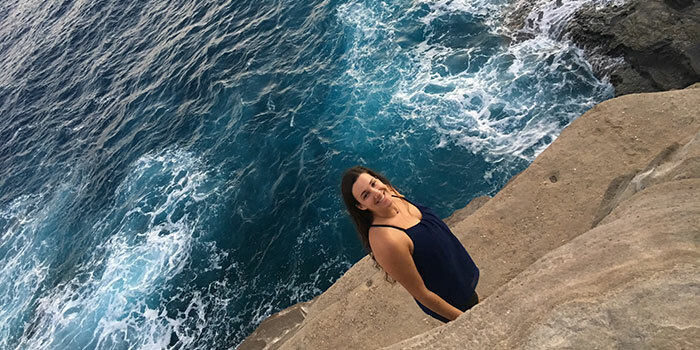 Sarah Rosenthal completed two cruises aboard NOAA Ship Okeanos Explorer, where her unique introduction to GIS helped to shape her future career plans. Read the full text of Sarah's interview below to learn more about her experiences. What were your duties as an Explorer-in-Training? While onboard, my duties as an EiT included assisting the mapping and survey team in multibeam sonar data acquisition and processing. I learned to process raw multibeam data, deploy Expendable Bathythermographs (XBT) for sound velocity corrections, process water column data, and update various acquisition logs. Through this professional experience I have not only become familiar with multibeam sonar operations, but also with a variety of GIS-based software such as ESRI, Google Earth Pro, QPS products, and Fledermaus processing suites. After my mapping watch was completed each day, I took every opportunity I could to observe and learn from other projects and tasks completed by scientists and survey technicians onboard. This has given me a truly unique introduction to an exciting field that has the potential be enhanced through a lens of spatial analytics. In 2012, I graduated with a Bachelor's degree in Biology and Zoology from Sonoma State University. Although my scientific career began many years ago within the biological sciences, the Explorer-in-Training program allowed me the opportunity to work with a motivating team of scientists that utilize GIS technology daily. I plan to complete my Master's in Geographical Information Science and Technology from University of Southern California in 2020. Where was your work experience located? If you were working at sea, what were your impressions of living and working on a ship? I am very fortunate to have completed two, month-long cruises aboard NOAA Ship Okeanos Explorer. As an intern, life at sea is filled with long watch shifts, lots of computer screens, and a unique living environment; however, I have yet to find anything as personally rewarding as working while out at sea. It is amazing what a month of disconnection from the everyday stressors of land life does to one’s mind. With every cruise I complete, I return home with a newfound appreciation for routine situations as well as a strong drive to continue forward in my marine career. My passions have gravitated towards water for as long as I can remember. Studying the ocean was a clear choice given 16 years of competitive swimming and water polo, combined with living most of my life surrounded by water (in San Diego and Hawaii). Upon moving to Hawaii, I began to immerse myself within the marine research community. I continued to work with various marine research institutions and on projects where I developed a comprehensive skill set within oceanographic research vessel operations and scientific research. I became skilled in field survey design and marine sampling instrumentation, calibration, and deployment/recovery. I also continued my passion being underwater as an active divemaster. What was the most personally rewarding part of your experience? It is hard for me to identify one specific aspect out of this entire series of rewarding experiences that I have received. A benefit of any research cruise I have been a part of is the opportunity to travel to new places and build new relationships. I have been able to sail to many places around the world that most will not get the chance to experience. It has allowed me to expand my strong network of scientific contacts and professional colleagues distributed around the world. One onboard conversation strongly influenced a pivotal point in my higher educational path with the onboard Expedition Coordinator and Mapping Lead of my first cruise. We discussed in depth the idea of acquiring a specific skillset to bring to the scientific community. I realized the many ways that past research projects that I have participated in would benefit from a strong knowledge of GIS. I anticipate that becoming proficient in GIS and associated technology will allow me the flexibility to scientifically contribute within a broad range of research topics. The many types of raw data collected onboard is just a starting point for further research, which I plan to incorporate in my master's thesis and hopefully future GIS projects. Since my first expedition, it has been incredible to watch how details of my professional life have proven to be interconnected with one another, and I anticipate this connective pattern to continue. During my graduate application process, I reached out to a University of Hawaii professor and collaborator with the Okeanos who initially interviewed me in person for the EiT program. He helped to connect me with other scientists analyzing bathymetric data, part of which I helped collect onboard during my first cruise. The entire mapping/survey team have motivated me throughout this entire process and I attribute a large portion of the success of my graduate acceptance to working alongside such an encouraging and supportive team. Please describe your final project. During my first cruise, I created an interactive computer-based gameboard via PowerPoint that could serve as a training or educational tool for the mapping and education team. I chose to include the knowledge I had gained from my experience onboard including life at sea, multibeam and other sonar systems, mapping, and geodesy. How do you see this experience fitting in with your future career plans? Even in the few months since my first cruise, I have noticed how this experience has had a positive influence on my professional life. This unique introduction to GIS has allowed me to see it as a powerful tool to further scientific analysis, which can ultimately empower individuals to make informed decisions. My career goals are to manage GIS projects and applications with an emphasis on marine exploration and conservation management.